Only in a filmography as stylistically restless and formally anarchic as Sion Sono’s would a somber family drama like The Land of Hope be considered a radical departure. Made in the aftermath of the Tohoku earthquake and ensuing Fukushima Daiichi nuclear disaster of 2011, Sono’s film is its own odd hybrid of Ozu-esque generational drama, speculative sci-fi, and searingly direct protest art. Set in a post-Fukushima Japan, in a fictional rural province called Nagashima (Sono’s invented portmanteau of Nagasaki, Hiroshima, and Fukushima, all parts of Japan catastrophically affected by radiation), The Land of Hope focuses on two neighboring farm families who are literally driven apart when a Tokoku-like earthquake causes a meltdown at a nearby Fukushima-like plant. Government officials in hazard suits build a barrier fence directly across the property of the Onos’ dairy farm, offering only the information that everything on the other side of the fence and within 20km of the plant must be evacuated. The neighbors are taken to a makeshift shelter filled with hundreds of local residents, but the stoic patriarch Yasuhiko (Isao Natsuyagi, in one of his final performances) refuses to heed warnings that his side of the fence may be just as unsafe. 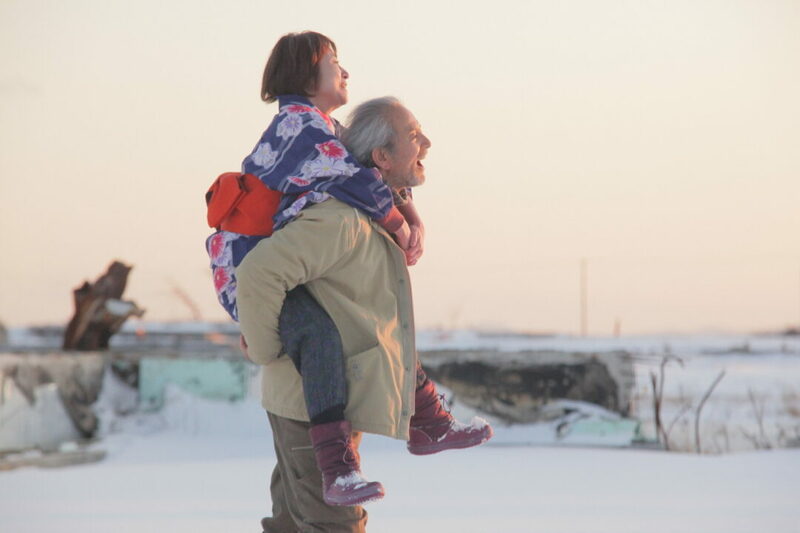 He and his dementia-stricken wife Chieko (Naoko Otani, heartbreaking) resolve to stay in their home while their son, Yoichi (Jun Murakami), and his young wife Izumi (Megumi Kagurazaka) flee to a nearby city. Izumi soon discovers she’s pregnant and obsesses over the possible effects of radiation exposure, keeping her father-in-law’s Chernobyl-era Geiger counter on hand, insulating their new bedroom with plastic and enclosing herself in a head-to-toe hazard suit before setting foot outside. Sono evokes her growing paranoia through his sound design: the insistent pinging of the Geiger counter bounces off of two submerged heartbeats, as Izumi goes warily through her day. Sono’s approach here is much more low-key and naturalistic than in the two films he made prior to this one—the epic saga of perversity Love Exposure and the anguished, wayward-youth manga adaptation Himizu—but he has rarely been so deeply attuned to the enduring struggles in Japanese society between young and old, history and memory, tradition and progress. Throughout The Land of Hope, Sono returns to an image of a stake being pounded into the ground—the building of the barrier across the Ono property. When Yoichi returns home to try and convince his parents to leave Nagashima for a safer area, his father elaborates on the significance of this: “It’s like we had a stake put through us…this time the stake is radiation. In a man’s life, it’ll just keep on happening.” In the next cut, a line of stakes has been driven across the room, through the table that separates Yoichi from his parents. Later, Sono returns to this image while Yoichi lays in bed thinking, and this time the figures of Yoichi and his parents all vanish, while only the room and the stakes remain. The image echoes an earlier sequence of wide shots capturing the evacuated Nagashima, vacant fields, and roads bisected by the barrier fence, and provides a deeply resonant vision of the way that the divisions caused by such traumas, whether natural or manmade or both, endure beyond the lives of those affected. So where, then, lives the hope promised by this film’s title? Ono’s greatest concern seems not to be his own well-being or that of his wife, but the assurance that his son’s family, and his unborn grandchild, will be safe. He is a proud, traditional man looking out for his legacy. The central image in The Land of Hope is a tree planted in the Onos’ backyard, surrounded by a small garden of bright colorful flowers. Yasuhiko and Chieko tend to it throughout, even as everyone else is evacuated and the foreboding barrier fence looms. When two representatives of the nuclear energy company visit to encourage Yasuhiko to leave before the government forces him off his property, he explains the significance of the tree: Planted when he and Chieko were married, it is now “a mark that proves our existence…valued over the family grave.” He points to two much larger trees that stand just on the other, condemned side of the fence, planted by his grandfather and his father. “Will I ever be able to go to these trees? Has radiation killed them?” Sono cuts to Chieko standing against their own tree, framed in such a way that both she and the tree appear taller than the fence, and the neighboring houses, emphasizing her bond with it. Throughout The Land of Hope, people are displaced, forcibly evacuated, wandering through towns devastated by disaster (shot amidst the wreckage of the real Fukushima), longing to return home. Yasuhiko Ono’s final sacrificial gesture is both a surrender to death but also a final refusal to die anywhere else. He and Chieko sink behind the flowers of their family garden, a gunshot rings out, the deep well of sorrow beneath this film ignites, and the tree bursts into flames.